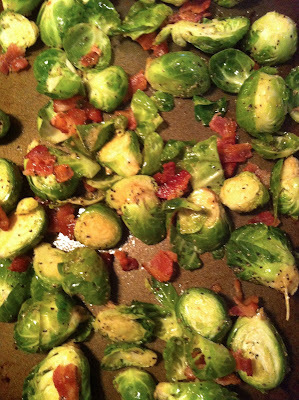 I'm here to share a quick but awesome recipe with you today -- bacon brussels sprouts! These might be my favorite side dish I've made in quite a while... so flavorful, so delicious, so hearty. Even people who think that they don't like brussels sprouts (*cough* my fiance *cough*) will be converted to brussels lovers with this recipe. Seriously! Pretty much anything mixed with bacon (oh, and bacon grease) tends to be pretty damn delicious though, right? Serve these brussels sprouts with grilled chicken or steak for a delicious, low-carb, paleo-friendly meal. I served them alongside a delicious red wine and balsamic marinated flank steak -- a recipe that I'll be sharing with you all soon! 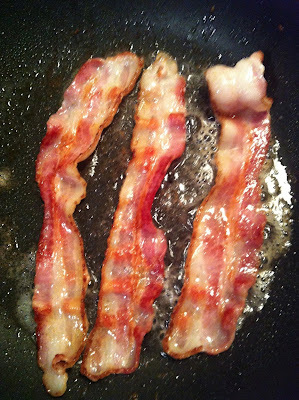 Cook three slices of bacon in a skillet over medium high heat until it begins to stiffen but is still chewy -- before it browns and crisps up. It will finish cooking in the oven. 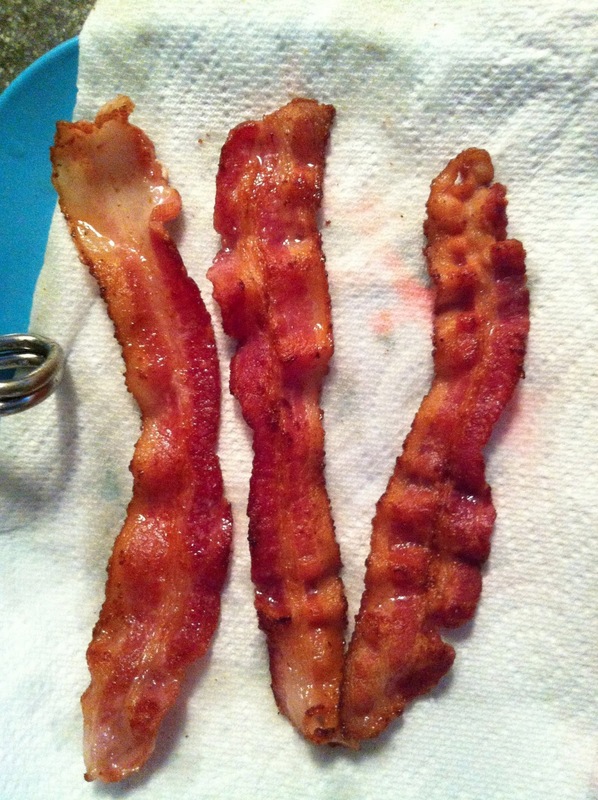 Then, remove the bacon and let drain on a paper towel. Don't get rid of that extra bacon grease in the pan yet though! 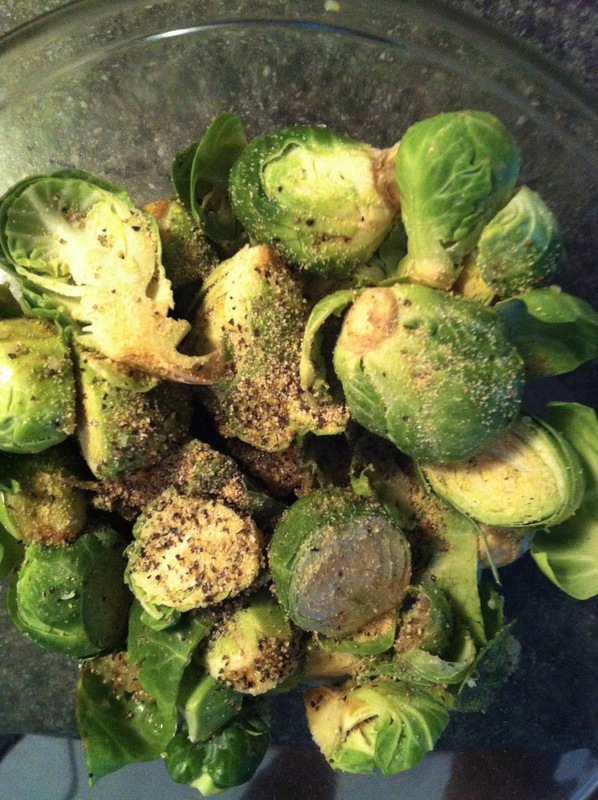 Save it -- it's gonna help make these brussels extra delicious. Meanwhile, chop your brussels sprouts. Or, be lazy (efficient?) like me and buy pre-chopped brussels from Trader Joe's. Put in a bowl and mix with olive oil, garlic powder, salt and pepper. Then, pour in 1-2 tablespoons of bacon grease. Oohhhh yeah. 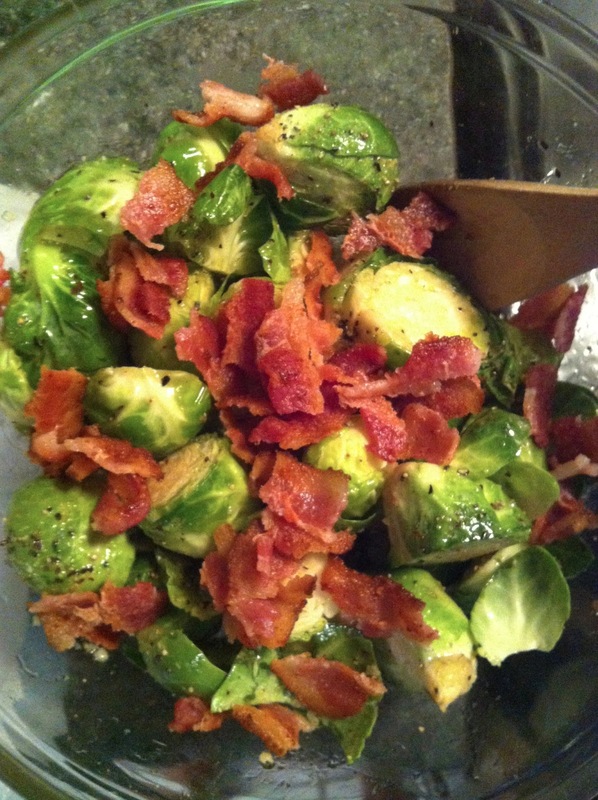 Break your bacon into small pieces and add to the brussels. Spread out on a baking pan. 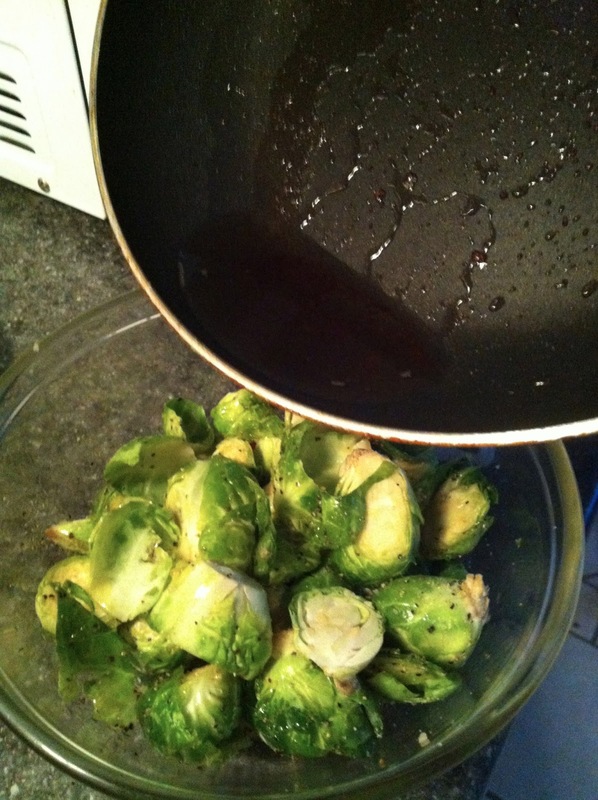 Roast at 375 degrees for 30 minutes, flipping the brussels over halfway through. I checked on mine at 10 and 20 minutes too to stir around and make sure they were cooking evenly. 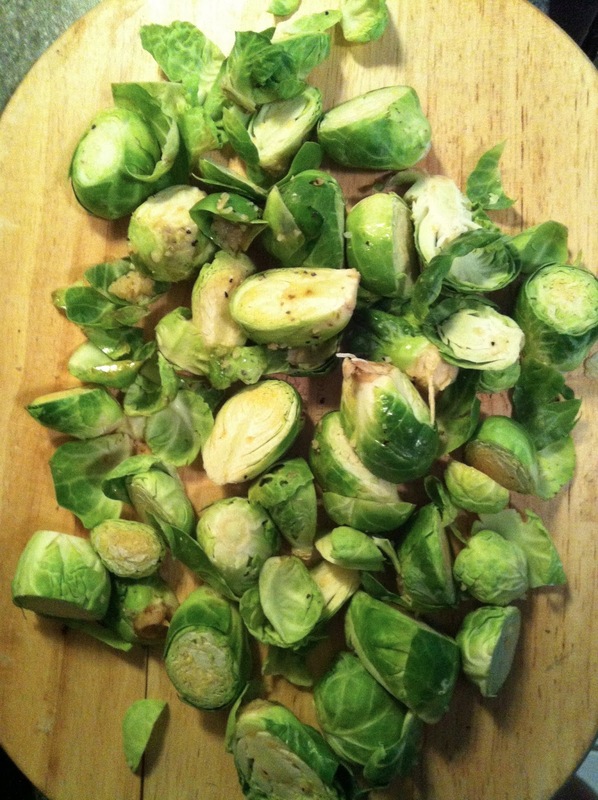 When they're done, a knife inserted into the center of a brussels should go in without resistance. -Cook bacon in a skillet over medium high heat until it begins to sizzle and stiffen, but before it becomes crispy and browned, about 5 minutes. Remove from heat and let drain on a paper towel. Reserve the leftover bacon grease in the pan. 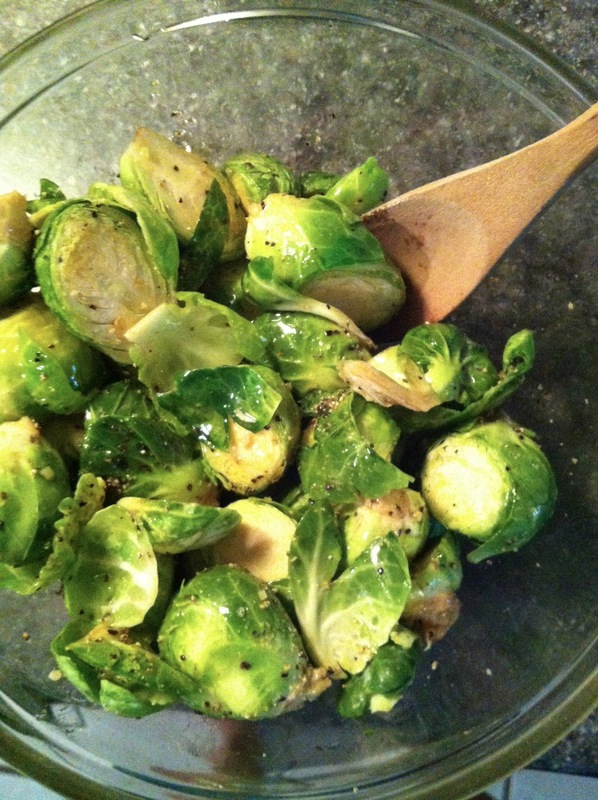 -In a bowl, combine brussels sprouts with olive oil and spices. Season liberally. Pour in 1-2 tbsp of the reserved bacon grease. Stir gently until well combined. Spread out on a baking pan. -Cook at 375 for about 30 minutes, or until browned and a knife inserted into the center goes in without resistance. Check on the brussels every 10 minutes or so, stirring around and making sure they are cooking evenly. Flip brussels completely about halfway through. Yumm -- We do ours with the same method but add a bit of parmesan cheese? SO good! Yesss, I've been known to add parmesan too! along with a little drizzle of truffle oil after baking... heaven.